In preparation for the release of the latest installment in the Pendergast series, Crimson Shore, I’m playing a little catch up, and read through both White Fire and Blue Labyrinth this month. Corrie Swanson, now a criminology student at John Jay College is determined to win the coveted Rosewell prize for best junior thesis. Having discovered anecdotal references of a meeting between Oscar Wilde and Sir Arthur Conan Doyle, where the former recounted a story concerning bear attacks in a 19th century mining town in Colorado, Corrie travels to Roaring Forks to complete her research and examine the bones for animal markings. Her brash personality and discovery that something other than bears attacked and ate the miners soon get her in trouble. Agent Pendergast quickly swoops in to help her but he is soon drawn in to the case of a serial arsonist torching million dollar homes in the upscale development of The Heights, with the home’s inhabitants locked inside. Add to this the mysterious search for an unpublished Sherlock Holmes manuscript and you’ve got yourself one action packed adventure on your hands. 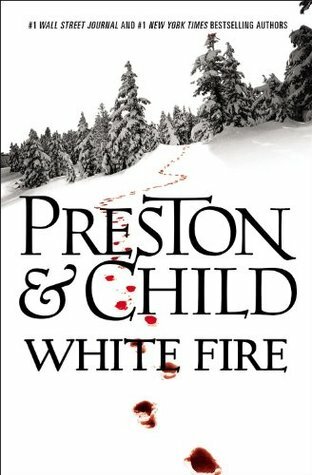 Although officially #13 in the Agent Pendergast series, White Fire functions almost entirely as a stand-alone novel, which is actually great if this is your first novel in the series. For those readers who have read the complete series to date, you will be familiar with Corrie Swanson, having first appeared in Still Life with Crows (Pendergast #4). While he does appear in this book, Agent Pendergast steps down from the limelight, and his young protégée Corrie takes centre stage and I must say she not only provides a fresh, feisty and strong female character to this mature series, but also to the action adventure genre in general. Full of action, adventure, mystery and the welcome dash of historical fiction woven through the storyline, Douglas Preston and Lincoln Child have once again created a wonderfully entertaining novel that was exciting and gripping to read. I absolutely recommend you read White Fire and if you are so inclined give the series a shot by checking out the first installment Relic. I give White Fire 4/5 stars.